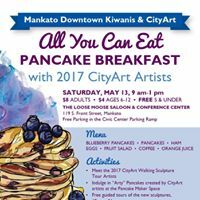 Mankato Downtown Kiwanis & CityArt Artists along with The Free Press MEDIA present, All You Can Eat Pancake Breakfast with the 2017 CityArt Artists. Saturday, May 13th 9 a.m.- 1 p.m. The Loose Moose Saloon & Conference Center 119 S. Front Street, Mankato Free Parking in the Civic Center Parking Ramp. Blueberry Pancakes, Ham, Eggs, Fruit Salad, Coffee, Orange Juice.